The world’s most expensive hotel ($8 billion construction and land acquisition costs) is the amazing Marina Bay Sands in Singapore. This luxury hotel was created as the centerpiece of an entirely new area of the city-state, reclaimed from the sea. The hotel’s now iconic three towers are capped by the enormous SkyPark. 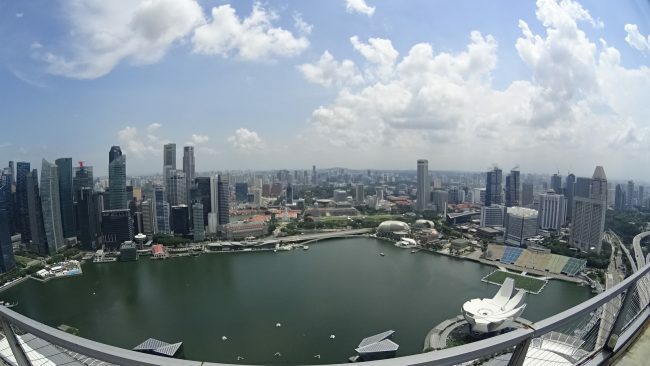 This aircraft carrier-sized terrace sits 57 stories above the Singapore shoreline and Marina Bay. Part of the SkyPark structure extends 220 feet over the edge of the hotel’s north tower. 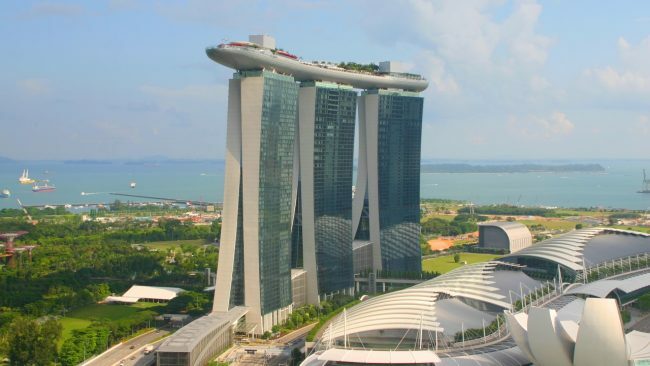 There a public observation deck and the SkyPark is home to the hotel’s mind-blowing infinity pool. The large pool (for hotel guests only) seemingly drops off the edge of the building. 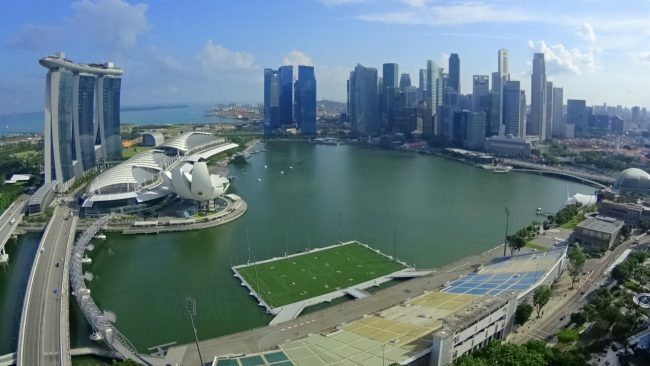 The pool also faces Marina Bay and the skyline of the Marina Bay area, making for seriously awesome photos and selfies. The SkyPark is also home to four restaurants, one being a Spago by Wolfgang Puck. I had dinner at Sky on 57 by Justin Quek, a delicious Franco-Asian experience from one of Singapore’s hottest chefs. There’s also a branch of the popular Asian restaurant CE’ LA VI and finally there’s Flight Bar and Lounge, a more casual space with great cocktails, cool music and what has to be the best view in Singapore. When you’re not swimming in the rooftop infinity pool, the luxury resort includes a huge casino and sits on top of one of the world’s great luxury shopping malls. A mall with its own ice skating rink, art museum, multi-plex movie theater, authentic hawker street food center and every luxury brand you could ever dream of. Interestingly and smartly, Singaporeans are not allowed into the casino, only visiting foreigners (passports are required for entry). The Marina Bay Sands is also a foodie heaven (as is Singapore itself) with over 60 restaurants on property. Ten of those are from celebrity chefs including offerings from Gordon Ramsay, Daniel Boulud, David Myers, Wolfgang Puck (2) and Mario Batali (3). I had a fun time staying in the hotel, although I found it quite large, overwhelming and a bit impersonal. There are so many things to see, do buy and eat, but it can be hard to find a space to yourself or a quiet area to relax, other than inside your own room. The rooms and suites are quite beautiful and even the most basic rooms are large and very, very luxurious. 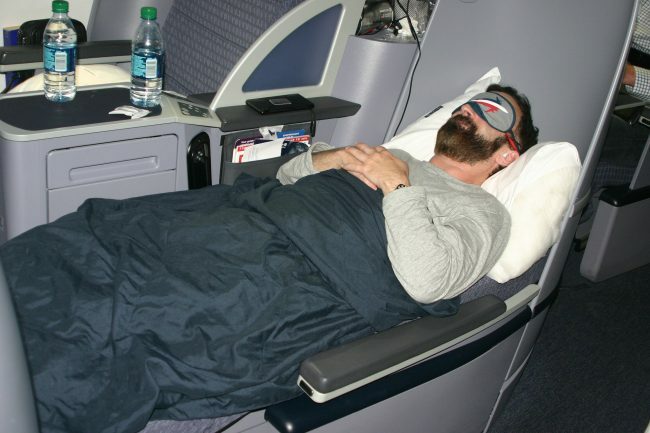 I flew to Singapore on United, on the inaugural flight of their direct San Francisco (SFO) to Singapore service. At that time, June 2016, it was the only non-stop flight from the U.S. to Singapore. Now Singapore Airlines also operates direct flights from San Francisco.